An amazing journey lies ahead, which means you need an amazing, travel-inspired wedding invitation to get you started. This seal and send features a colorful map background with vintage compass and borders. Your wording is printed in your choice of colors and fonts. The invitation features a perforated response card printed with your return address on one side and your response wording on the other. Guests fill out the card, remove it and return it to you (be sure to place a stamp on the card for guests' convenience). 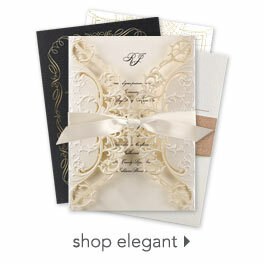 The price includes printing your wording inside and your return address on the outside flap. We were looking for a simple invitation that was budget friendly and cute, this was it. We did upgrade our stock to shimmer which just added that extra bit to it. The only downside we had to the invites was some older people invited do not understand that you tear off the bottom half and send it as a post card. Another thing we noticed is one of the invites was cut wrong and was pretty much of no use for sending, however because we bought extra we didn't really care and used it as our tester for adding in our wedding website info with clear labels because we totally forgot to do that before hand. So it worked out perfect. We also got some cute silver foil seals with little hearts on them at a craft store and those added the perfect touch for closing the invites up where the return address is. However if you have family like mine, I would say go with a more traditional invitation. As evidently this product can ruin a mothers life, and embarrass her fully. They are nicely made. I upgraded the card stock to a bit thicker. That helped make them appear more like an invitation rather than a postcard. Loved that this was able to be so personalized. Loved the options of texts for each section. Everything arrived quickly and was perfectly packaged. A great product, a great site. The invitations are beautiful. If you're looking for little something extra order the shimmer paper. Also I added a wax seal in Lou of the plastic stamps. The invitations did not need any additional postage. These invitations turned out great. We have a destination wedding so the map in the background looks perfect. Loved the quality , size, and the idea of this type of invite. I got the shimmer finish due to a previous review and would definitely recommend. It had just enough of a sheen, not overwhelming at all. I did not love the stickers they came with to seal the invite (not horrible just plain white) so I just went to Michaels and got rustic brown stickers and and anchor stamp. The combo looks great. The customer service was excellent (Sherry!)) and the delivery time was early. All around a great experience from start to finish. I ordered a sample of this design first in the value paper and did not like them. The paper seemed very cheap and flimsy. However, I ended up ordering my invitations in the shimmer paper and I think they would also be nice in the textured paper. Mine are beautiful and super easy to send. Just fold them up and put the seals on! One stamp on the outside covered postage.The design is perfect for my vintage travel-themed wedding.